Can anthropogenic linear gaps increase plant abundance and diversity? Seed-dispersing animals often move along “linear gaps” (linear anthropogenic features such as roads and trails that contain little vegetation), especially in densely-vegetated landscapes. As a result, linear gaps and their verges may receive more seeds than adjacent habitats. In addition, linear gap verges may provide more suitable conditions for plant establishment than neighboring habitats. In this way, linear gaps may increase plant abundance and diversity, and facilitate connectivity of native and non-native plant populations, ultimately increasing plant diversity in the landscape. We reviewed current evidence for the potential of anthropogenic linear gaps to increase plant abundance and diversity, and for the mechanisms involved. We reviewed peer-reviewed literature published up to December 31st, 2014. 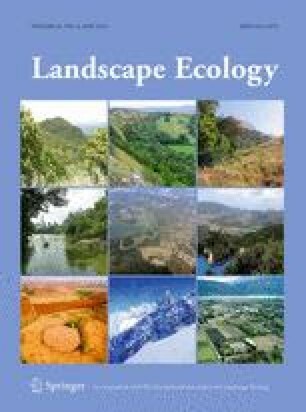 Most (69.2 %) studies found significantly higher plant abundance and/or diversity in linear gap verges than in adjacent habitats. This suggests that linear gaps can increase plant abundance and diversity, and possibly facilitate population spread. However, there was a strong bias toward the study of exotic species. In addition, there were few mechanistic studies to allow estimation of the relative contributions of dispersal and post-dispersal mechanisms operating in linear gaps. Future studies should focus on entire plant communities, not just exotic species, and should allow identification of the mechanisms by which linear gaps increase plant abundance and diversity. With this knowledge in hand, we will be in a better position to understand whether the net benefit of linear gaps for plant diversity in general outweigh their facilitation of the spread of exotic species. The online version of this article (doi: 10.1007/s10980-015-0329-7) contains supplementary material, which is available to authorized users. We thank Doñana Biological Station, Carleton University, University of Alberta and Yukon College for their logistical support. Alistair Auffret and two anonymous reviewers provided helpful comments on earlier versions of the manuscript. This research was financed by the Spanish Ministerio de Educación (FPU grant to A.S.E. ; AP2008-01874).